The GPI super structure is responsible for housing and keeping aligned several sophisticated subsystems, each weighing a few hundred kilograms. While isolating these subsystems from the relatively high vibrations from both the telescope structure and GPI’s own two hundred kilograms of electronics and cooling systems, it must control relative flexure to less than the 100-micron level over all operational orientations and provide the necessary stability to the precision IR interferometer. Additionally, Gemini imposes strict mass, centre of mass, space envelope and power usage and dissipation limits. The mechanical structure is a pair of cantilevered truss structures: one for the non-flexure sensitive components and overall enclosure (external frame structure, EFS), and the second the opto-mechanical components (flexure sensitive structure FSS). Each subsystem is kinematically constrained with three bipod flexure truss assemblies. 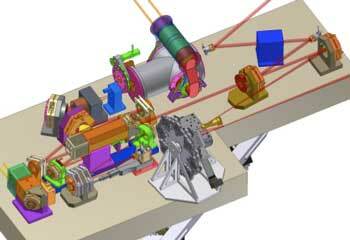 GPI’s opto-mechanical super structure (OMSS). The diagram maps the locations of the AO, CAL, and coronagraph units. The plate on the right mounts to the Gemini instrument support structure. 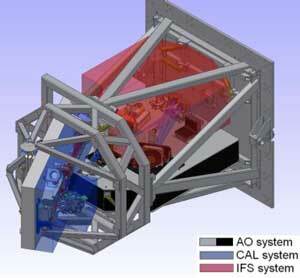 The three main subsystems are the AO relay (AO), the calibration system (CAL) and the integral field spectrograph (IFS). The AO optics will be mounted on a custom cast-aluminum optical bench, with the optics all in-plane. Individual optics will be superpolished to have less than 1 nm of mid-spatial-frequency wavefront error, supported in extremely stiff mounts to minimize vibration and flexure. 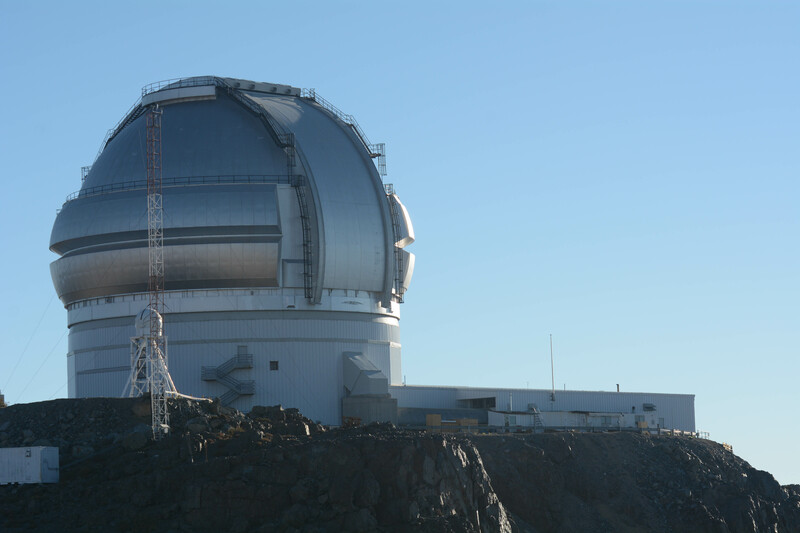 The whole instrument will be surrounded in a better than Class-1000 enclosure to control the accumulation of dust particles thatwould scatter starlight and hide planets. The bulk of the electronics are mounted in cabinets outside this enclosure, cooled by chilled glycol provided by the observatory. With the combination of the very stiff mechanical design and open loop control of tip and tilt on 5 fold mirrors, the OMSS will maintain the 1-2 cm optical beam fixed to less than 1% of the its diameter throughput the entire optical path.